Enjoy was of ultimate importance to the brand for revving up the wheel of mass segment once again after the long reign of Tavera. Since one year after launch, General Motors India today celebrated the first anniversary of the arrival of the popular Chevrolet Enjoy MPV with the launch of the 1st Anniversary edition. Launching the anniversary edition, GM India President and Managing Director Arvind Saxena said ? “Chevrolet Enjoy has completed a very successful ‘Year of Enjoyment’ on Indian roads. It has given our customers a spacious multi-purpose vehicle and a luxurious drive that is enabling them to enjoy life with their families and friends. ?Since its launch in May 2013, the Enjoy has sold close to 20,000 units. It has taken on the toughest competition in the newly created MPV-B segment, he added. The latest member of the Enjoy family, the 1st Anniversary Edition is available with a choice of seven and eight seats and an exciting & stylish accessories package. It is being offered for a limited period. Based on customer feedback, the enhancements make the award-winning MPV even more stylish and appealing for esteemed car buyers. GM India is launching an integrated marketing campaign to promote the 1st Anniversary Edition and celebrate the first anniversary of the Enjoy.? The Anniversary Edition offers free accessories on both the exterior and interior with exclusive badging giving it a distinct identity. The stylish exterior enhancements include a chrome kit for the headlamps, tail lamp, door handles and tailgate apart from roof rails, side body decals, OSRVM blinkers and chrome license plate garnish. 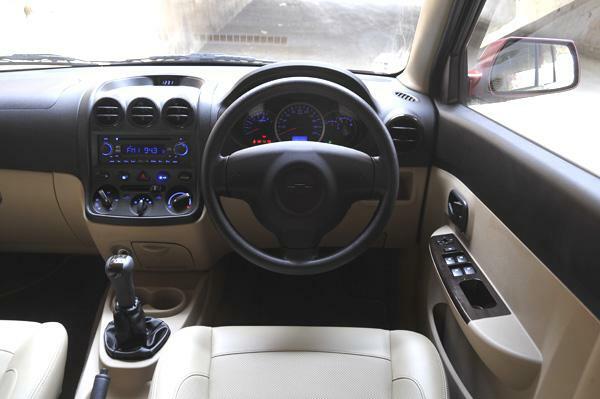 Wooden dashboard trims have also been added to the interiors for a trendy and sporty ambience. It may be recalled that the Enjoy has received four coveted awards from industry experts and consumers, making it the most-honoured M?PV last year. In addition, the Enjoy launch has received ‘Best Integrated Campaign Award’. The Enjoy is available in six colors: Velvet Red, Candy White, Switchblade Silver, Seadrift Grey, Caviar Black and Linen Beige. It is powered by a 1.3-litre turbocharged DOHC diesel engine producing 74.8 PS @ 4000 rpm and a 1.4-litre SMARTECH petrol engine producing 100.2 PS @ 6000 rpm. The Enjoy returns one of the best in class mileage in the MPV categories and comes with a standard warranty of 100,000 kilometres or three years whichever is earlier. 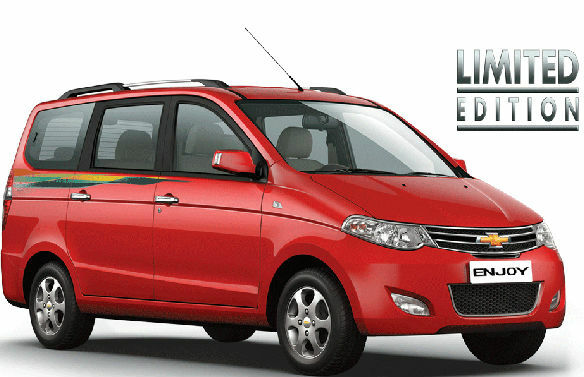 Chevrolet Enjoy Limited Edition is launched to mark the celebration of 14,000 Enjoy sold since launched. Hence, the MPV of US-based carmaker gets the changes in form of cosmetics only, technicalities continued to be carried over the same from existing variants. Enjoy Limited Edition is available for diesel as well as petrol buyers. The cosmetic change are termed majorly in the form of new chrome kit, garnished the door handles, tail lamps, air dam edges and number plate enclosure. Decorative body graphics, roof rails, darkened pillars, ORVMs mounted side indicators are some other changes witnessed on the Limited Edition Enjoy. On inside, the dashboard is draped in all new wooden trims. 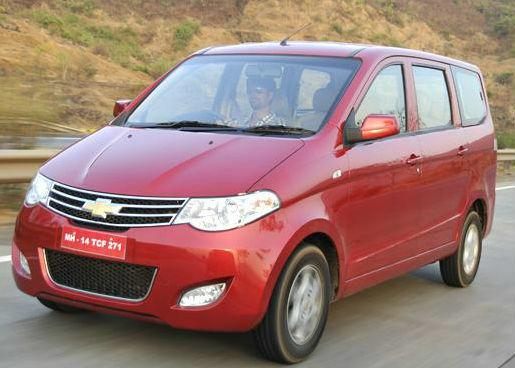 Chevrolet Enjoy (Limited Edition) is powered by a 1.4-litre 104PS petrol and the 77.5PS 1.3-litre Multijet diesel engine. Both the power producing machines comes attached with a 5-speed manual gearbox. The accessories which the bowtie logoed carmaker has plugged on its MUV for celebration quote is worth more than grands; but as it is a call of celebration it isn’t charging anything for all of those under the guise of “Limited Edition En-joy! Meant to be for everyone, Chevrolet designers at the backend are working a lot hard to give us the best in possible Indian lines. And to be honest, we all know what it takes to make a new product launch in India. It isn’t that easy here to roll out a newbie. The Indians are more demanding, they want the entire upward nothing package at the ground touching price. And we hope that is the reason why Chevrolet couldn’t manage to make most of it in the early days of its tenure in India. Hopefully, we are not wrong to say that, with previous couple of launches (like with Sail sedan and Enjoy MPV) they are targeting the audience who stays most probably in the Tier II and Tier III cities of India. And yet they are successful in luring those audiences with following the trait of fewer prices, and more advanced product. It means the value of money is delivered by applying the basic standard in all the stances inside. But the outer crisps of product to be most luring of all and that should not compromised in factors like quality and others. Like recently they launched the Enjoy MPV for India, it was basically taken from the market of China and then shifted here with minute tweaks carried to make it specific with regards to Indian mentality. Enjoy is basically designed by the GM’s Chinese partner Wuling, and that is the reason for it to be a bit different than other of the Chevy’s sibling like Captiva, Tavera who falls in larger-than-sedan class. When talking about the roundabouts of Enjoy we came to know, the core idea of the American carmaker is to gain brownie points over others in terms of day by day growing MP MPV segment, where the famous Toyota Innova, Maruti Ertiga Mahindra Xylo and its in-house Tavera are standing successfully in the line for quite long years. On contradiction, while looking at the price tag of Enjoy we can say that Maruti Ertiga seems the only competitor to it in the respective segment. Both of them (i.e. Ertiga and Enjoy) are targeted towards the private ownership of automobile society whilst the others are famous with tour operators bagged by yellow number plates. 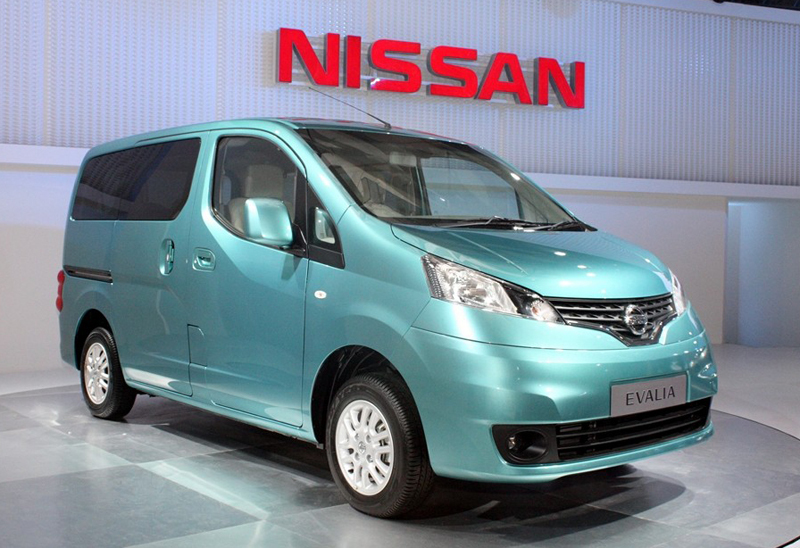 And looking at it one, may also comment it for a direct competitor to Nissan Evalia too, which is not false et al. To know what the Enjoy had stored for all of us, we had jolted down the notations below that we had experienced during our test drive. For the looks, Chevy had always scored 10 on 10 in our test book. All thanks to its bowtie logo, which makes the designers to work out those stances that goes perfect with the golden American badge. Not even making an exception, bowtie logo had always catered to all the Chevrolet metals around the world, and in India too there is no one who can match up to this point of Detroit based carmaker for exterior looks. Coming back to the Enjoy we learnt that, there is a lot of difference between the Evalia and Enjoy. Nissan Evalia is however like it the same way, but Chevy had done oodles of its signature on it to make a standing out statement than others in the competition. The crispy creases on bonnet, three slat front grille, chromed encircled air dam with mesh type inner lining, and hopefully the swiftly placed bowtie logo on the face, made us to drool over it. The bulge cutting line transfusing from the headlamp to the rear is adding a new twist to the car, and accompanying him is the line travelling from the one end of wheelbase to the other one. Proportionally contoured chrome along with these lines on exteriors makes it to look a slightly niche class than the rivals. For some it maybe a kiddish comment, but truly we had found it some glimpses similar to that of luxury Limousines being seen in the cities of Europe and others. However, it is true as well, Chevrolet had designed it concluding those gossips itself, but that we will discuss later in this article, now it is to talk about the headlamps. Headlights of Enjoy are fitted in the wraparound manner and when one look at it, it gives them the feel of crowned jewel on the Chevy MPV. Those leaf shaped fog lamps are enhancing it to some additional notches. However, the length of it is not cribbed under four meter context, the carmaker should have given it with more bigger wheels than the 14inch. It looks pretty small when one would look at the car; it seems Enjoy is wearing the boxers of younger brother at the time when it could not found its own for the roll out to happen. The so huge body line and this so cramped wheel is making us to go uneasy for the exteriors at last, and then we decided to take out eyes off it, now let’s move inside to view what the surprise being stored there for us to know. Open the doors and step inside, it sits just next to one of the Limousines in Europe. Ample of spaces for everyone, two captain seats in the top end variant, the cheesy third row seat is the inclination that there is enough for every role that you play daily in your life. Whether it maybe a professional life or the family, no chances that this car would bite you back in the doom of space. Despite of any given trim level, the second row passengers are bestowed with the blowers on their head. No complaining about the chilling comfort even in summer. The AC works steamily enough to keep you cool in all the alluring Indian season but minus the “climate control” feature on this Chevy for the cost-cutting sake. Front seat are also not bad at all. They are quite comfortable in the place. The actual delight is captain seats on second row. Those couple of goose had good amount of thigh support, back support and beefy back support, but they pose disappointing results when you need to comfort yourself in the movement on twist and turns. Even the leg room is nice to fit in the tall guys. Moreover, Enjoy enjoys ‘taller headroom’ than other and easy moving space from the ‘doors to seats’. This is all because of the monocoque chassis on which the Enjoy is build. Avoidance of ladder on frame (chassis) for this one gives the ample of inches inside. Passengers can easily move in and out of it by the wide array of doors given. And as the floor is also placed lower than conventional, placing the luggage at rear and the in-out movement doesn’t find any clichés. Talking about the third row, it is a bit cramped. More to it, Chevrolet hadn’t given the option of foldable seat for second row so the last benchers have to go by crouching in between the two pilot seats of second row. However, the third row is not as spacious as the second one, but it is as par than its rivals available in the market. Sometimes, even the adults too can spend the time there, creating more legroom by moving forward the second row seats with the function given of sliding second row (seats) back and forth. All that was about the functionality, now comes the ambience of cabin. Enjoy uses two tone dashboard which is quite simple, and at the same time boring too. The all beige color interiors gives in the feel of airy and cool cabin, but it doesn’t matches the desired quantum of quality. Plastic used of anywhere inside the car is not satisfying at all. It feels nasty and old school like the one is sitting in those Force badged and other such typical rural Indian driven vehicles. There are ample of cubbyholes on inside but most of them can’t be used due to their narrow measurements yet creepy. There is a couple of holder too on the front seat, but is capable of holding the cans, instead of ferrying the 1liter water bottles in it. We must not say this, but the plastic covered on the gear lever is also giving a nasty feel, being pitched of very cheap quality plastic. Surprisingly after this long quench of cosmetic arena, now comes the driving portion, and it all starts with the driver seat. The pilot seat is slotted in the very right manner. No fatigue at all, even going long distances. The height adjustment feature is also there to adjust you in the position you desire. Large windscreen and (relatively) slimmer A pillar spreads the road view evenly on our eyes. The simple yet bold looking dials on the speedo is not disappointing at all. Just once again, the music player is now done with the single din and no Bluetooth at all. Complementing this lacking, the Chevy then had embellished Enjoy with a multipurpose 12V accessory charging outlet in the third row seating area. Lest, being an MPV we hadn’t mentioned about the boot space yet. Not to disappointment again, the foldable third row seat makes a way for the luggage upto 630 liters. We hope no one now had complains about it. Going on a long journey, it can swallow a kid’s small sized bicycle too in the belly, whilst more of palate would be still there to stuff in more of the cargos inside. 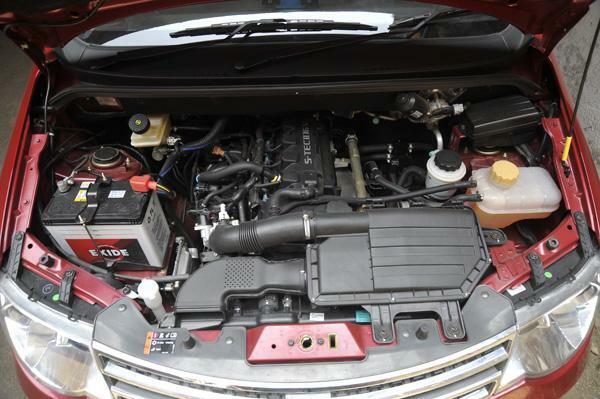 The fuel type what we are driving for this version is 1.3L Fiat Multijet diesel engine. Going back to original roots, GM did not have an oil burner in China for the Enjoy, and specifically for India they had made a one. If the organization would have minus the diesel from the list of MPV here, then there is not a single point cranked for launching the vehicle here on Indian roads. Hence, as an outcome, someone at the backend must have stormed his brains very strongly and may have sorted out this brilliant engineering idea to let the Chevrolet had his own piece of cake and eat it too. There is no better option than the Fiat’s 1.3L Multijet if one is considering mileage and power for an India specific diesel vehicle. The boffins at Chevrolet had taken the 1.3L Multijet, flipped it for 90degrees, and then placed it longitudinally in the engine bay. It is connected to the rear wheels, and marries a 5speed manual Wuling gearbox. Start the engine, and it settles to the idle very swiftly. There is not a ‘lot’ of vibrations coming, lest those some of them who sneak peeks through the floor. Though the engine is spongy and responsive, after getting started it vies to get the vehicle in motion as soon as possible. Starting to turbo from the 1600rpm, all the excitement goes up to the mark of 4000rpm, and then after that it dies, means that driving in city is quite effortless. No shifting the lower gears in traffic to move up the jerk of acceleration. Weighing around 1345kg, the 73bhp engine finds a lot tough to nag it around so quickly. Comparing Ertiga and Enjoy in the 0-100kmph run, the former was very quick than the latter one. In spite of getting defeated by the Maruti at early in none-to-ton sprint, Chevy is cool to fiddle the city rides. As we just said, one need not to dangle the hassle of cordoned upshift, vehicle quirks up very quickly and lean the way forward in same gear itself. It doesn’t put a lot of strain on the driver’s end while doing the rounds of urban jungle. In spite of having the swift shifting gear slots, the long throw at gear lever is deriving the loosely feel to car. While it is a diesel engine, the rev at 1200rpm produces a vibe-ful trauma in the cabin, specifically when it is being driven in start-stop city traffic. We hope that GM may bring in a solution to this problem soon. Enjoy uses the MacPherson struts on front and Multi Link Coil Spring on rear. Both of them are tuned in towards more of the softer note, in return they optimize this value addition to give the maximum possible comfort on potholes. Without jerking a lot, you are easily crossed the broken Indian roads, even the larger tramps also does not blow up the passenger from his seat. Meanwhile crossing the potholes, the sharp edges over rear axle tends to wade a bit more and can be felt easily on the steering when it swoops past the breakers and other ruckus of our tarmacs. Tight corners and twists are also not a serious concern for the Enjoy to steer into. It does its job perfectly, and sweeps out the dirt of it lying there inside. Sometimes, it needs to be sipped in with more nudge than the actual at these sorts of actions, because of the relatively boxy designs it tends to move outside the lane sometime. Braking too is sufficient enough. At times it too fixes you in the confusion regarding the amount of brake applied from one situation to another. So we had found a way to it, and that is give your 100% on the brake pedal to make the car stop, and don’t go for the second thought while applying those. And apart from the braking extravaganza nothing is there to point out negative in this car for ride and handling section. Steering is also light and comfortable enough. It is light for most of the time. Even feeling stiffened at places it will take you easily through the city roads very easily. There is a loose feel being observed on the open highways, but that is not so possessive when you are the behind of such a massive MPV. First of all, we are very impressed with the logic that GM had introduced to us in the form of using the Fiat’s 1.3L Multijet diesel engine that was not present in the originally rooted Chinese version. They thought of it this way, seems challenging for the engineers there at the backend. But hopefully apart from the ‘cheap quality plastic’ laded interiors, and the ‘not so refined gearbox’, there is not much for us to explain negativities about this car. The performance is good, and it also yields the mileage of 18kmpl, concluding the mixed drive of city as well as highway. 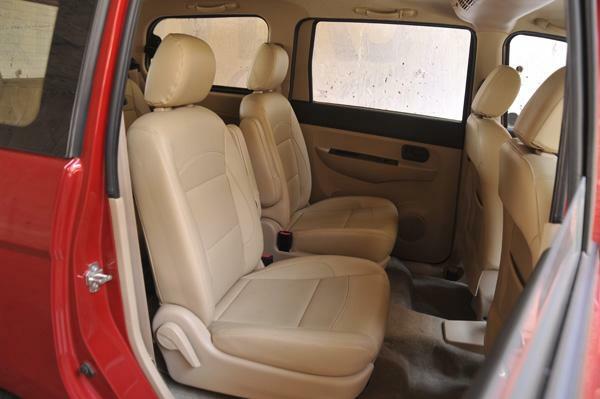 Ample of spaces inside, and the more of practicality done in the seating arrangement, is capable enough of locking horns with the India famous Maruti Ertiga very aggressively. Chevy had also planted the most efficient price tag of Rs. 6.69 lakh for diesel version of Enjoy, so it comprises a lot of span in the industry like Ford EcoSport and other such. Truly, a value for money product. Chevrolet working on compact Enjoy? GM India is supposed to be working on the sub 4 meter version of its new MPV, Enjoy. According to reports from AutoCar, GM is thinking about a downsized version of its Enjoy MPV. The sub four meter vehicle will be cheaper than the current model inheriting the excise benefits received by the sub 4-meter vehicles. The vehicle will come with petrol and diesel mill with capacity less than 1200cc or 1500cc respectively. It is possible that GM India will be downgrading the current 1.4 litre 102 bhp petrol engine to 1.2 litre 85 bhp engine which is currently seen in Chevrolet Sail. The main motive will be to push the vehicle in the benefit region received by the sub four meter segment. The reduction in the boot space and power will be compensated by the reduced weight, the sub-four meter Enjoy will weigh about 150 kg less than the current 7-seater version that is in sale, this will help to increase the performance and efficiency. The current vehicle is about 4305 mm long and hence the designers will have to slash more than 305mm to bring it in the desired segment. The smaller version will have to give away the third row seats, thus will come as a five-seater. More than that, the excise benefits will make this vehicle about Rs. 40,000 cheaper than the current vehicle. With the reduction of that much amount, the vehicle will stand directly inside the price window of the premium hatchbacks. GM is currently struggling in the Indian market but the UV segment is showing superb growth and the company just want to cash the same. Over the past few years General Motors have made a mark in the Indian market by launching its variants on Indian roads. Out of all other car-makers who come under General Motors, Chevrolet has emerged as an off the hook choice of customers with their wide range of models starting from Aveo U-Va to Forester. They have manufactured almost all types of cars from hatchbacks to sedans and sports utility vehicles (SUVs). 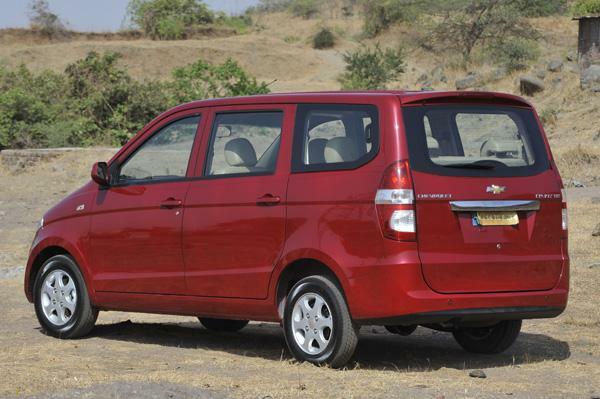 Recently Chevrolet showcased its MPV in Auto-Expo, 2012 which caught loads of eyeballs. The makers of MPV took a lot of time deciding a justifiable name for the car and ultimately came up with something as simple as “Enjoy”. 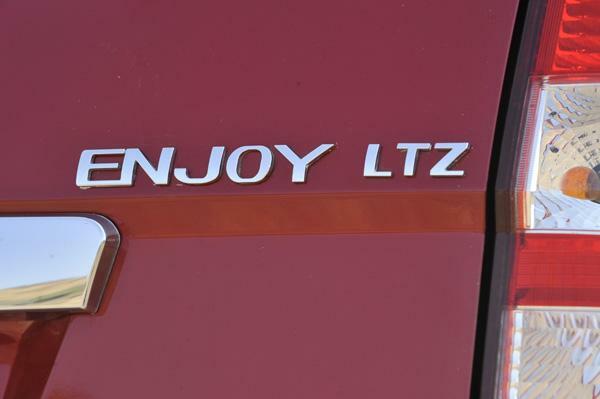 Thus now the MPV will be known as “Enjoy”. General Motors decided ascertained that the name goes well with the characteristics of the car and the features it has to offer. Initially General Motors came up with the name MPV but considering the fact that same cars are known as MPV in China so General Motors made it a point to come up with a new name and thus “Enjoy” came into being. The demand for Enjoy is seeing an impressive rise owing to the fact that it has Toyota Innova and Mahindra Xylo as its competitors but its price is relatively lower than them. 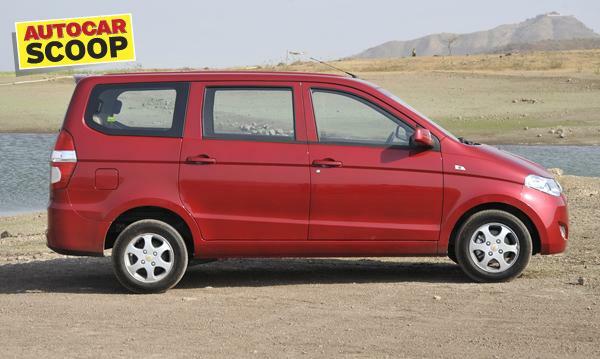 The price range of MPV “Enjoy” has been fixed at Rs 5-6 Lakhs which is less than that of Innova and Xylo and thus will increase the demand in the Indian market. Initial speculations were rife about Chevrolet launching only Diesel models in the Indian market but now the vice-versa has been confirmed by General Motors which has ascertained that petrol variants of the model will also be rolled out onto the Indian roads preferably along with Diesel variants. Initially Chevrolet plans to roll out the petrol variant and will then launch the diesel variant after analyzing the sales of the model. The diesel comes with a tuned 1.3 L multijet engine whereas the petrol variant comes in 1.4 L gasoline engine. The petrol variant is said to give an impressive horsepower of 96 bhp which is in par with the configuration of Chevrolet Sail. Ever since Chevrolet brought Aveo to India, people have given positive response to the petrol model and have acknowledged the manufacturing of the car. 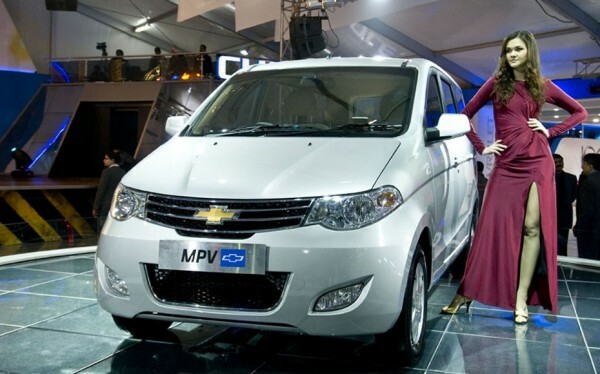 And now by introducing MPV Enjoy to the Indian customers and that too in a petrol model, Chevrolet aims to sell maximum units of MPV once they launch it in mid-2012. There are many other cars lined up to be launched into the Indian market by Chevrolet. Out of these, MPV Enjoy has been highly anticipated and following the Auto Expo people are waiting to get their hands on the keys. 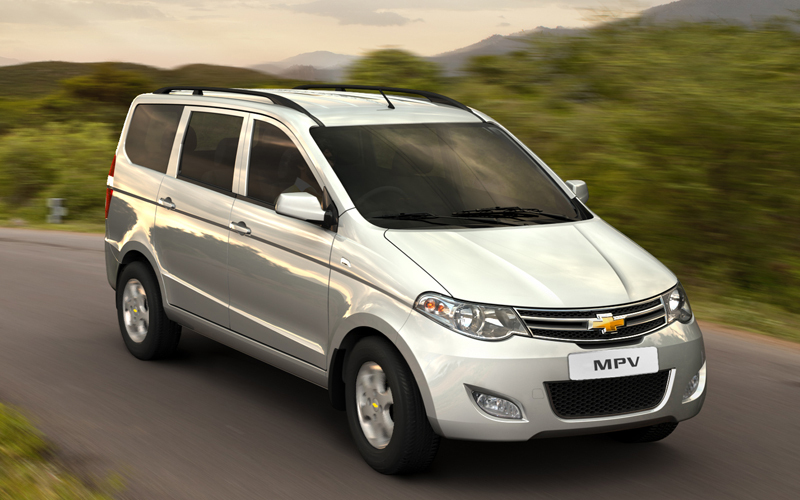 Once MPV is launched Chevrolet plans to critically analyze the sales process and demand in the market. Thus those looking forward to purchasing this car will have to wait till mid of 2012 and then “Enjoy” the experience of being inside a Chevrolet.